BUFFALO, N.Y. — The Black Widow of eating contests has scarfed down 183 chicken wings in 12 minutes to break her own world record set last year in Buffalo, N.Y.
Sonya Thomas took home first place Sunday at the tenth annual National Buffalo Wings Festival. She beat eating marvel Joey “Jaws” Chestnut, who came in second with 174 wings. The two won titles at the July Fourth hot dog eating contest on Coney Island. The 100-pound Thomas of Alexandria, Va., is the reigning wing-eating champion. She downed 181 wings to win the 2010 contest. Chestnut of San Jose, Calif., settled for second with 169 wings. The winner gets $1,500. The runner-up wins $750, and third place gets $300. Thomas is called the Black Widow becomes she often beats male competitors in eating contests. Mayor Cox Elorde of Bunawan township pretends to measure the crocodile which was captured by residents and crocodile farm staff along a creek in Bunawan late Saturday in southern Philippines. MANILA, Philippines — Villagers and veteran hunters have captured a one-ton saltwater crocodile which they plan to make the star of a planned ecotourism park in a southern Philippine town, an official said Monday. 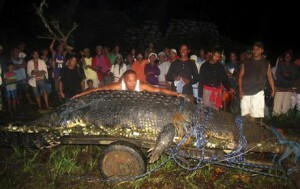 About 100 people had to pull the crocodile, which weighs about 2,370 pounds, from the creek to a clearing where a crane lifted it into a truck, he said. The crocodile was placed in a fenced cage in an area where the town plans to build an ecotourism park for species found in a vast marshland in Agusan, an impoverished region about 515 miles southeast of Manila, Elorde said. BAY, Ark. (AP) – An Arkansas man who wanted to capture aerial photos of his home during his first plane ride instead helped catch two men burglarizing it. Lynn called an uncle who lives nearby. He also called 911. Craighead County Sheriff’s deputy Phillip Wheaton said the two men unloaded the trailer and left the scene when the uncle arrived. But the pilot and Lynn’s uncle followed them until they were stopped near Bay by Wheaton and two other officers. “They were giving us turn by turn directions and giving us a description by county road,” Wheaton told television station KAIT. From AP stories at signonsandiego.com and emissourian.com.